Like most families, we will be scaling back our holiday giving this year. Instead of mountains of new toys, we'll be looking for gifts that will last a long time, have lots of play value, and that are in keeping with our family's values. I always look for one or two things that help the kids expand their cultural horizons, I thought I would share some of our current favorites as well as the toys I'm considering for this year. My kids love watching the adventures of the two sisters in the Little Travelers DVD explore the world, and these are among the few DVDs that I actually enjoy sitting down to watch with them. Over time, it's been really fun for me to watch the kids act out scenes from the movies. Their current favorite is pretending to make Mochi by pounding on the ground with sticks. I previously published a full review of Little Travelers Japan DVD. We've hung various US and World maps in E's room, but somehow the kids always seem to love them to death after a few months. I'd love to invest in a high quality canvas map (like this one from IKEA for the whole family. As the kids grow, I know it will be a great way for us to learn about the places we're headed as well as places in the news. We are a Lego family, and I have to admit that I'm a little obsessed with this Lego Taj Mahal set. It's way out of my price range, but I love the idea of building well known buildings like the Lego Make & Create Eiffel Tower 1:300 (on sale now for $159) or the Lego Sears Tower (just $20) or better yet, buy some Basic Lego Bricks and try to recreate some of your favorite buildings. My kids have a set of basic wooden blocks that they come back to over and over again. The way they play with them changes over time, but they never seem to fall out of fashion. 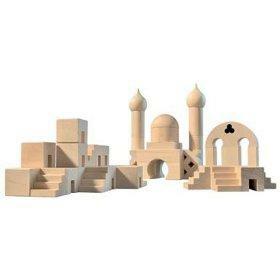 It would be fun to familiarize the kids with other architectural shapes, and I love this Middle Eastern Blocks from Haba. The company also makes a Russian House , Antiquity Architectural Blocks , Japanese House Building Blocks and many other architecturally themed building blocks. We've had this sushi set in our car for over a year now, and we grab it each time we enter a restaurant with the kids. Of course it's especially fun when we happen to be eating Japanese food! The set is simple, but the kids like rearranging the blocks, sticking the sushi rolls together (each piece has velcro) and cutting them apart again. Pretending to eat each piece usually takes up enough time that they don't even notice the long wait for our food & we think there's nothing cuter than watching E dip his real sushi in the fake soy sauce. Shelly Rivoli (Travels with Baby) on December 11, 2008 at 11:04 a.m.
Lego Taj Mahal! Also out of range, but very cool. Thanks for the refreshing suggestions! Rebecca on December 11, 2008 at 11:40 a.m.
Love the wooden sushi set. Too cute! What a great idea to have a special toy for restaurants. Might have to give that a try. My little ones get restless real quick when we eat out. Berit @ TrustyPony on December 12, 2008 at 8:56 a.m.
Yay wooden sushi! Love it. May I respectfully add something to the list? The new 3-D World Atlas & Tour book. Comes with two sets of 3-D glasses. It's one of those things you're glad your kid has so you have an excuse to look at it too. Mara Gorman on December 12, 2008 at 9 a.m.